It's a bird, it's a plane... no it's a priest! Roman Catholic priest Father Antonio di Carli has gone missing after floating away today off the southern coast of Brazil. 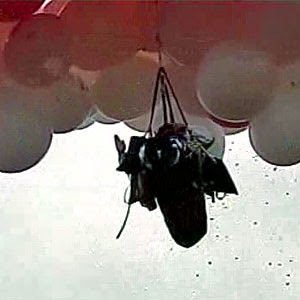 Tethered to hundreds of helium party balloons, Father di Carli of Brazil lifted off from the port city of Paranagua wearing a helmet, thermal suit, and a parachute. He also carried a GPS device, satellite phone, and buoyant chair. Rescue helicopters and small boats are searching the waters off the coast of Santa Catarina state where pieces of balloons were found. Father di Carli was reported missing after he failed to make contact with port authorities eight hours after party balloon lift off. The priest had wanted to break a previous 19-hour record for the most hours flying with balloons to raise money for a "spiritual rest stop for truckers". The missing priest had initially soared to an altitude of 20,000 ft. then descended to 8200 ft, when winds pushed him in the wrong direction, out over the water. He was purportedly 30 miles offshore when last heard from. I’m starting my descent at 16,000 feet and I just passed a guy in a lawn chair with a gun. 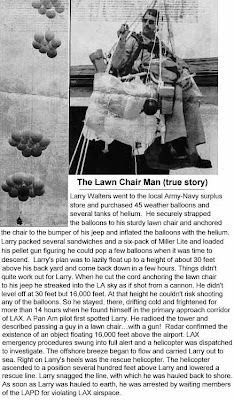 While Father di Carli reached an altitude of 20,000 ft. it was another man back in 1982 who soared to an altitude of 16,000 ft., or three miles, in a lawn chair carried by 45 weather balloons along with sandwiches, a six-pack of beer, and a pellet gun.